Family game nights are a super fun way to engage and spend time with your kiddos - without spending a dime! 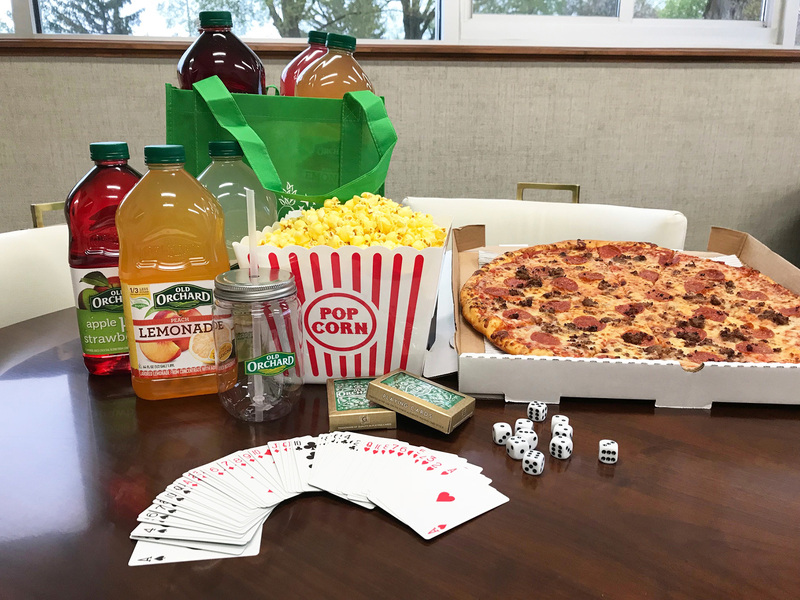 Submit a photo of your family at game night enjoying your favorite Old Orchard Juice flavor for your chance to win the ULTIMATE Prize Pack filled with all of your game night necessities! Complete our online form to submit your family photo. Entries must be received by May 31, 2018 at 11:59pm ET. Five Grand Prize Winners will be selected at random - Good luck! Take a picture of your family at game night enjoying your favorite Old Orchard Juice flavor. Complete our online entry form, including your contact information and submit a photo of your family at game night enjoying your favorite Old Orchard Juice flavor. NO PURCHASE NECESSARY. To enter, complete the entry form found online at https://oldorchard.com/promo -- including your contact information and a photo of your family having game night enjoying Old Orchard juice; or, submit your entry on Twitter, Instagram or Facebook, tagging Old Orchard's social media account and using the hashtag "#OOFamilyFun". The submitted photo must include an Old Orchard juice bottle to be considered a valid photo entry. Alternate entry by mail: mail in a 3 x 5 index card with your name and address to: Family Fun Night Sweepstakes, Old Orchard Brands, PO BOX 66, Sparta, MI 49345. Sweepstakes and contest begins May 14, 2018 at 12:00am ET. All entries must be received by May 31, 2018 11:59pm ET. There is no limit to the number of entries you may submit. Each unique, eligible entry will constitute a unique sweepstakes entry. The promotion is open to all legal residents of the United States, 18 years of age and older on or before 11:59 p.m. ET, May 31, 2018. The promotion excludes employees and immediate family members of Old Orchard and its parent companies, subsidiaries, affiliates, assigns, advertising, promotional and fulfillment agents, attorneys, and other representatives and the persons with whom each of the above are domiciled. Five Grand Prize Winners will be chosen at random by Old Orchard out of all of the eligible entries. Limit one winner per household. All winners will be contacted via the email address provided or via the social media account of entry; prizes will be sent via USPS or FedEx. Any selected winner that does not respond within 7 days of notification will forfeit their prize and an alternate winner will be selected. The Grand Prize winners will include “free juice for a year” in the form of 52 VIP free product coupons, each redeemable for a free Old Orchard 64oz juice product, up to a $3.69 value; two decks of Old Orchard playing cards, a 12oz bag of gourmet popcorn, a $25 gift card to Pizza Hut and a prize pack featuring an assortment Old Orchard logo’d apparel and merchandise. Approximate retail value of the Grand Prize $250. All prizes are non-transferable and cannot be sold or redeemed for cash. Old Orchard may substitute a cash payment or substitute prize of equal or greater value at its sole discretion. Any federal, state, or local, taxes are the sole responsibility of the winners. Old Orchard is not responsible for any lost, damaged or misdirected mail. Prizes will be awarded providing there are at least 5 unique, eligible entrants. For the names of prize winners, send a self-addressed, stamped envelope (postage not required from Vermont residents) to Old Orchard Attn: Family Fun Giveaway – Winners List, P.O. Box 66, Sparta, MI 49345. All requests for a list of winners must be received by 11:55 p.m. ET on August 20, 2018.